Turn on the engine of this car to start a very deadly brutal race. Run on dangerous roads collecting combat skills. Shoot opponents with targeted missiles and smash their vehicles before they reach the finish line. This fun game can be made from any device: Smartphone, tablet and PC. Dare and click on this exciting game, drive the cars in a fierce competition where you must shoot your opponents so they do not touch the finish line. 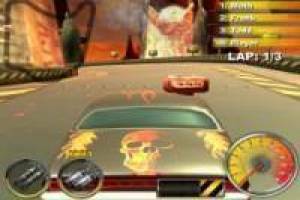 Enjoy the game Lethal Brutal Racing, it's free, it's one of our racing games we've selected.